Are you an avid traveler or just a dreamer? 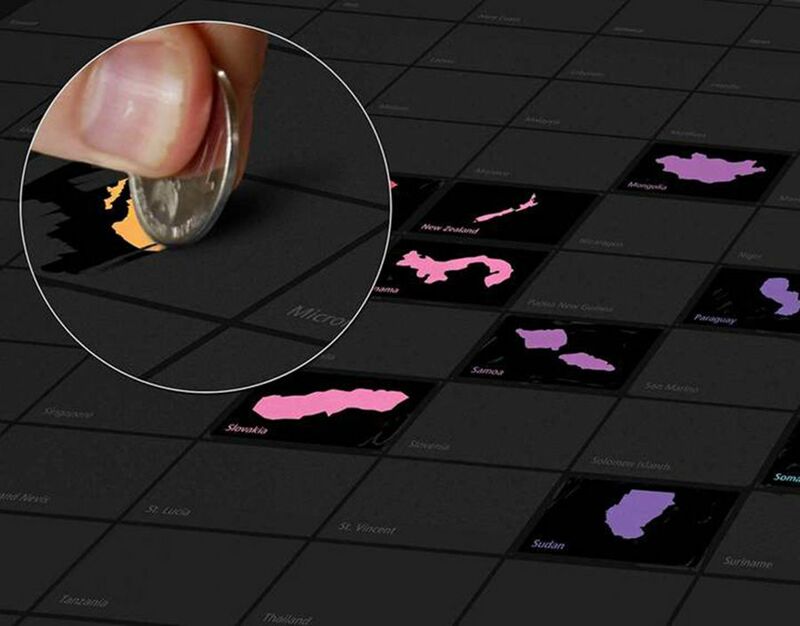 Then scratch off map is something that you can definitely enjoy. These special maps allow you to mark those countries which you’ve already visited. Over time, your map will be brighter and you will be able to visually analyze where you have already been. Traveler scratch maps is a positive thing that will be a pleasant reminder of your travels. Scratch maps make a perfect gift for both children and adults. That’s perhaps the number 1 reason why such maps are super popularity today. 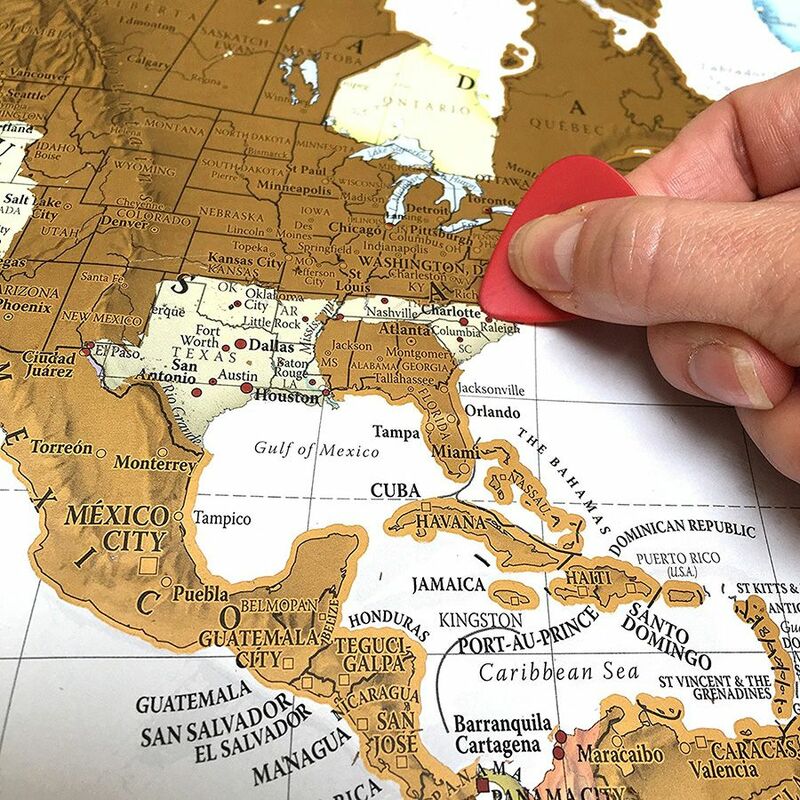 Not only do they allow active travelers to mark their visited destinations but also make a fun alternative to traditional children maps when it comes to exploring the world. The map itself is made of thick varnished paper with a high-quality color printed inner- and an easily erased outer layers. The best part of such maps is its dynamic nature. A new bright spot emerges every time a new personal geographical discovery is completed. As a result, the scratched off places will serve as a reminder of the experienced sensations and emotions as well as motivate for the new trips to yet undiscovered destinations. If you liked the idea of such a personal travel diary, it’s time to search for the best options online. 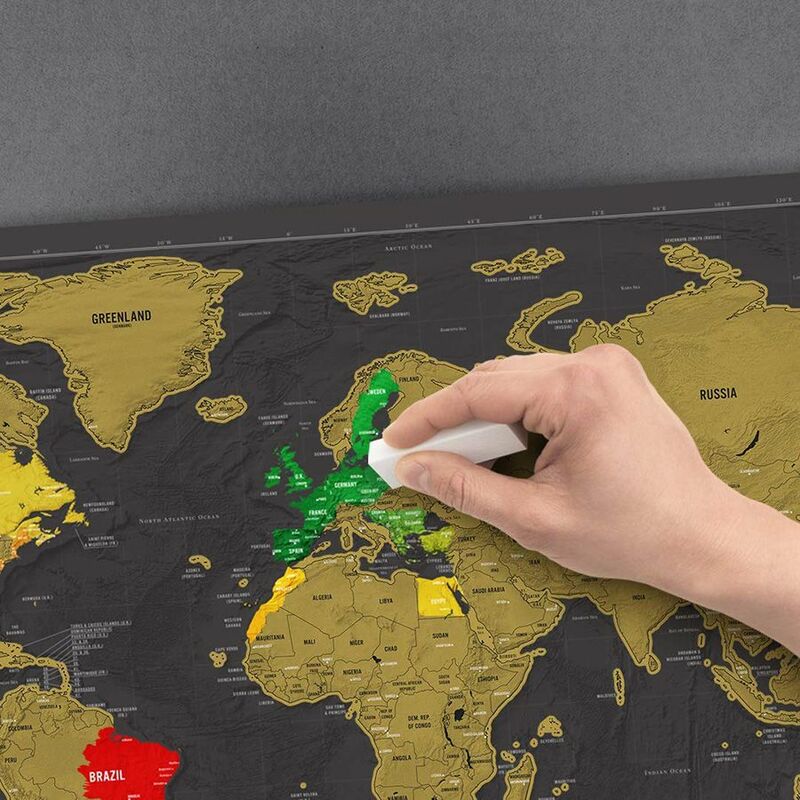 Below we have listed 15 best scratch maps of the world, USA, and Europe from different manufacturers and online stores. The following world map looks very elegant and stylish. The mix of white background and golden scratch-off coating can fit almost any home interior, whether it’s a minimalistic Scandinavian or a lush vintage style. Featuring countries, cities, hill shading, and state outlines on both coating and a map underneath. 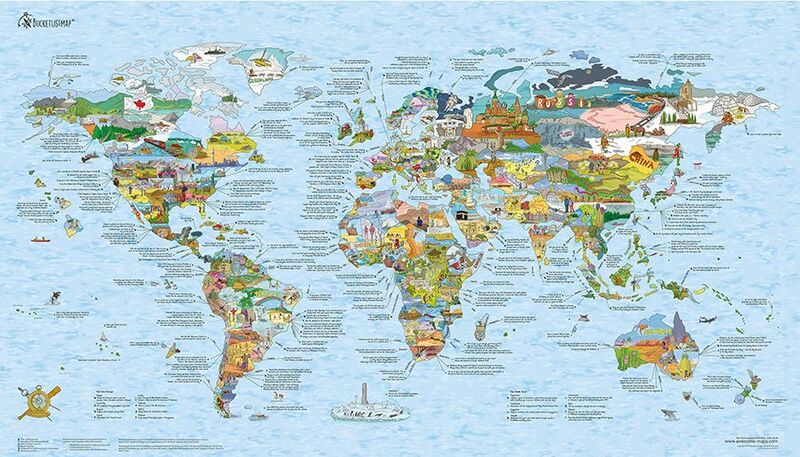 If you’re looking for a children version of the scratch up world maps, this one makes the best choice for a number of reasons. First of all, this map looks the most approximate to traditional world maps designed for educational purposes. Second, not only one stimulates kids to learn the location of all countries but also helps them memorize their flags. Finally, with such a fun map design, the learning process would never get boring. Additional tools: a scratch pen for tiny elements, a blue pick for larger areas, and a microfiber cloth to remove the foil after scratching. For all original design lover, consider purchasing the following ENFY scratch map. Just look a little bit more attentive and you will discover a LOT of interesting illustrations with elements relevant to every world country. No doubt, both kids and adults will appreciate such an artistic design of their gift. Comes with a tube packaging, 3M stickers, and a scratching pin tool. Reveal the bright colors of the world laying under the golden foiling together with the Luckies of London Scratch Map Deluxe Edition. Manufactured in the United Kingdom and developed by cartography experts and designers, there are no doubts about one’s premium quality. Includes a plenty of geographic details: capital cities, American and Australian states, Canadian provinces and territories as well as rivers, mountains and more. The Bucketlist scratch map can be rightfully considered as a separate masterpiece. The map design was created completely by hand – a hand of a talented German illustrator Lars. His vibrant and playful style of drawing helped him develop a unique product that looks nothing like other top scratch maps from the list. A huge abundance of details will make you examine the canvas for hours! Silver scratch coat – a new formula for buttery smooth scratching. If you are not a great fan of thin and crumpling paper, or you’re worried your little kids will spoil the paper scratch map quite fast, there is a nice solution. This is a transparent resilient plastic scratch-off map designed to last for decades. Use the coin to remove the silver coating and a rewritable marker to make short notes on your future travel plans. Also includes a metal scrapper, fastening pins, felt cloth, rewritable marker, and travel stickers. Yes, it’s not completely the world map in the way we are used it to see. 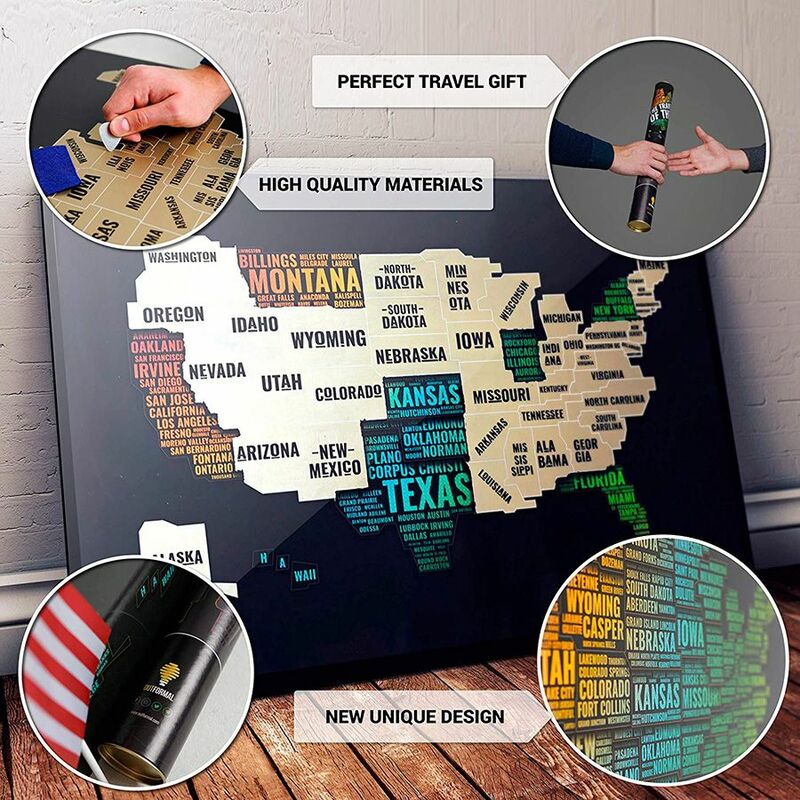 Nonetheless, if you are looking for something more original than just a regular world map, this world A-Z scratch map will make the best choice. All 195 countries in alphabetical order. Just another erasable designer’s scratch-off map with a stylish high-quality coating and red-colored layer underneath. Looks stunning! Comes in a stylish tube with a metal scraper, fastening pins, felt cloth, and rewritable marker. Did you know there exist 3D versions of the scratch maps? For a change, this compact cardboard globe will be a nice gift for everyone on any occasion. Come in a unique and sturdy travel tube. If you live in the United States of America, there might be a chance to find traveling to Europe or Asia rather an expensive activity. But think of how many US states you and your buddies have never been too yet. 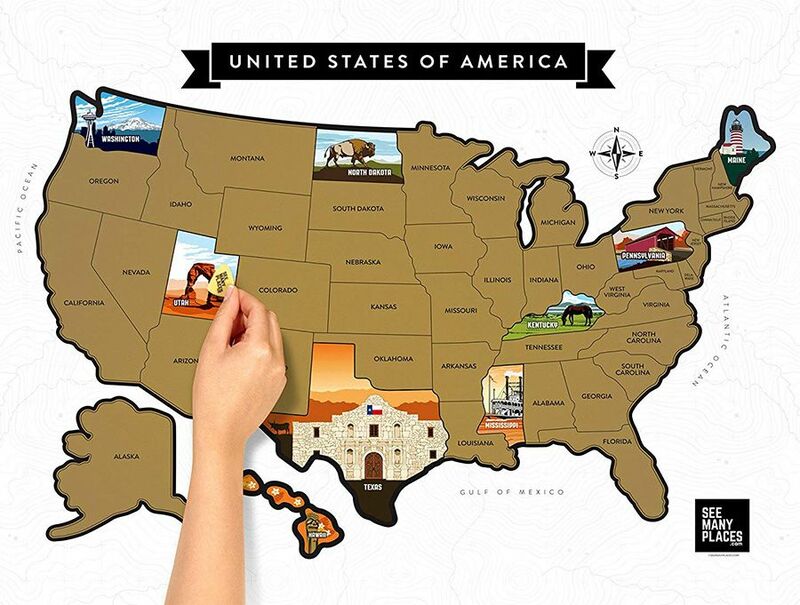 Purchasing this stylish Designer Scratch off Map of the USA will be the first step to start traveling more. Comes with a gift tube, an American flag, stickers, a red marker, a gift card, a scratch tool, felt cloth, and pins. This one is for the lovers of more traditional-looking scratch off maps containing not only the states’ name but full colored images-associations underneath the gold foil coating. 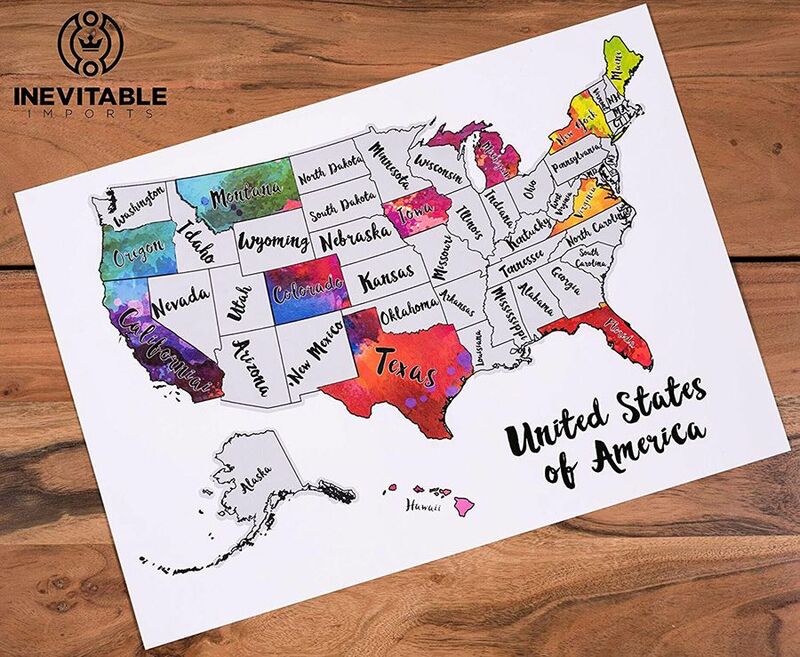 With every next revealed illustration, you will definitely want to scratch off more and more states until all of your US destinations are completed. What a great motivation to start! Comes rolled in a protective tube enclosed in a poly bag. To those looking for a vibrant-colored scratch off map of the United States, here is the best option. 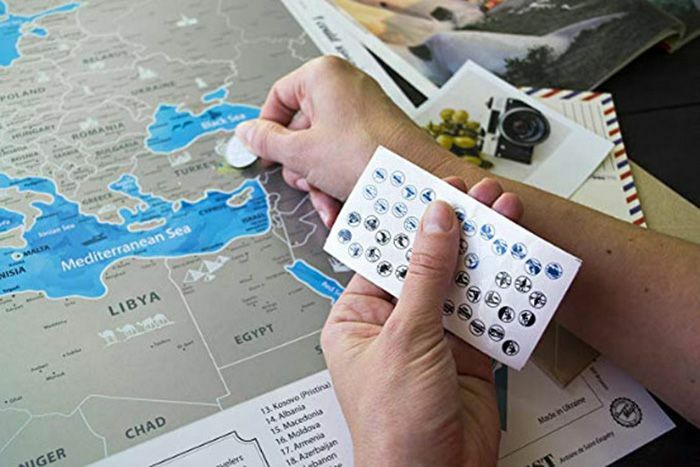 Unike others, this one is a small travel scratch map universal both for children and adults. One more thing makes it different from the other options – a unique design underneath the top layer. Map size: 17 x 12 inches. Comes in a durable tube. A HUGE part of your experience in another country is about trying local food specialties. 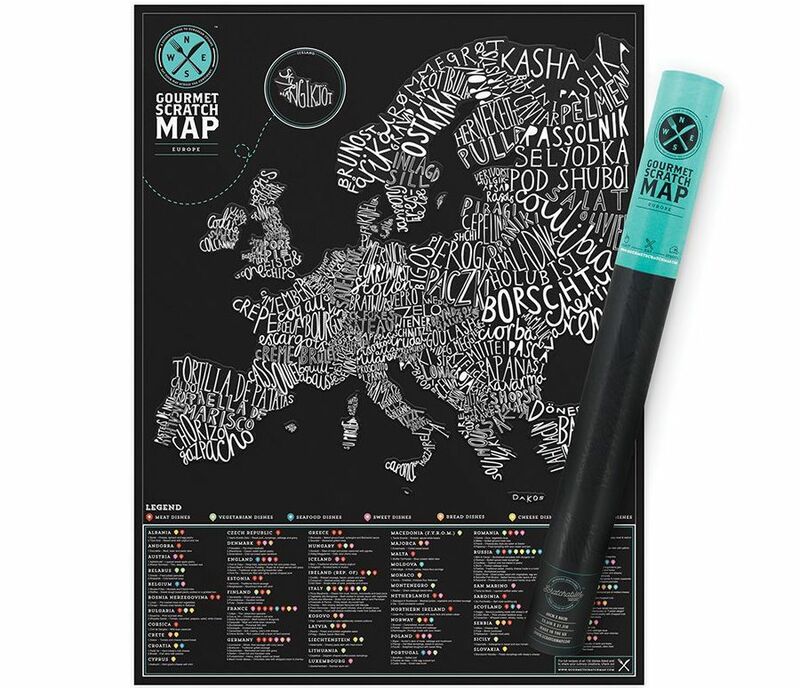 If you are passionate about foreign cuisines, just buy this scratch map and you’ll be able to track the number of “completed” European food destinations. Comes in a unique gift travel tube (no additional wrapping needed). Let’s agree on the fact that a black and golden map design like this looks very stylish. At the same time, once you scratch the top layer, the countries will turn out multicolored in pleasant shades of green, blue, yellow and purple. Such a map will be a perfect decoration for your home office. Comes with a beautiful gift tube, gold stamping box, markers, as well as a coin and scrap off felt to remove the scratch layer and its remains. Finally, we came close to the largest and most detailed Europe scratch off map on our list. Yes, not only one includes the name of each country but also covers all big cities, over 50 national parks, rivers, lakes, mounts, and more. A beautiful blue color of the oceans and colorful countries underneath the soft scratch foil will always please your eye, even after a while. Packed in a nice tube with handmade drawings. 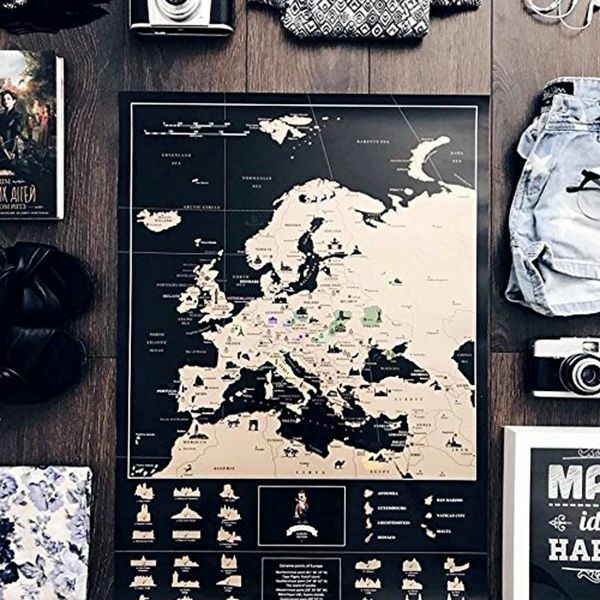 No doubts, all of the maps from our top 15 that you can hang on the wall will be a perfect addition to your home interior or make a good gif for any occasion. Do not skimp on a high quality!